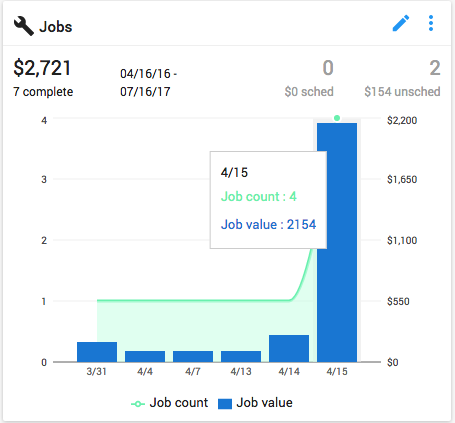 The jobs dashboard allows you to quickly view the number and dollar value of your recent jobs. 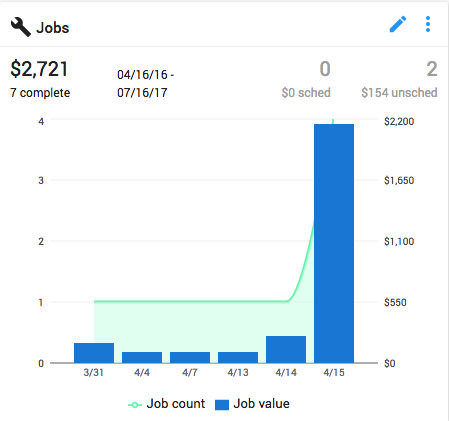 It also allows you to quickly see the number of scheduled and unscheduled jobs along with the amount of money for each. The bar graph displays the number of jobs on the day while the line graph displays the amount of money for those jobs. Hover over any section of the graph to view exact numbers for a given day. By pressing the blue edit icon, you can view the full job detail report. This report can be filtered based on date range and table columns.